Wilson Electronics 304411 wide band log periodic antenna operates in the 700 - 2500 MHz frequency range. 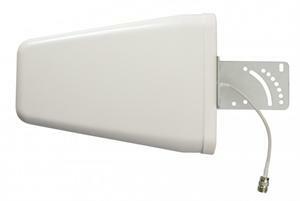 This directional dual band antenna provides a gain of 8-10 dBi and has a maximum input power of 100 watts. This vertically-polarized directional antenna is terminated with an N Female connector. Antenna mounting hardware is included. Wilson 30441 wide band log periodic directional yagi antenna is weather resistant and easy to install.